At the outset, in late August, it's 19 metres tall and 30 metres wide and carries an estimated 700,000 leaves. Its roots spread up to 30 metres from the trunk and a digital scan in mid-January shows it weighs almost 10 tonnes. As the days shorten and the temperature drops - the oak, nearly 400 years old, has to make what McGavin calls "a colossal redistribution of its resources" – the first of four seasonal transformations it needs to survive. "Driven by hormonal signals, trees begin to break down pigments and nutrients in their leaves to store over the winter," he says, producing spectacular autumn colours. Once the nutrients are extracted, the leaves are shed. But leaf drop isn’t triggered by cold weather. 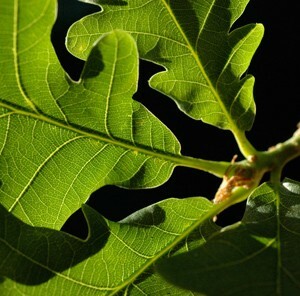 The oak can in fact sense red light in the spectrum using a chemical pigment (the phytochrome system) in the leaf cells which allows it to measure the hours of daylight. 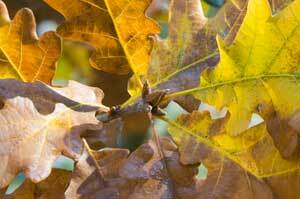 By October, when the oak is releasing acorns, there are six hours less sunlight every day than at the summer peak. In winter – the oak's "most perilous season" – the bare tree needs to stay alive in extreme cold, using almost no energy. The bark acts like a blanket, but if the liquids inside the oak were ever to freeze solid the tree would suffer catastrophic damage. So it withdraws fluid from the cells, dehydrating itself. The remaining liquid has a high concentration of sugars – "a kind of antifreeze", according to McGavin. Most nutrients are stored in the oak's roots over the winter months. But the root system alone isn't enough to extract vital minerals from the soil. The oak also needs "a vast army of microscopic filaments" to survive, including mycorrhizal fungi to extract phosphate from the surrounding soil. Springtime brings an "epic growth spurt" and by late April catkins – the male flowers – emerge. Packed with pollen grains, they're dispersed by the wind to fertilise the female flowers and create the acorns that will continue the oak's life cycle. A month later the oak is in full leaf and colonised by insects. Among them is the winter moth larva, which eats up to 27,000 times its own weight in young oak leaves. 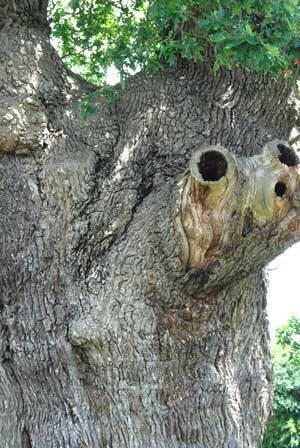 The oak can recognise chemicals in the creature's saliva and defends itself by producing phenolics and tannins to hinder the larva's growth. 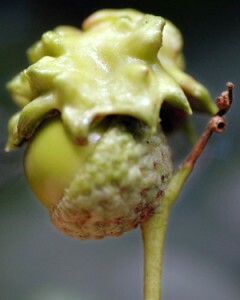 Meanwhile gall wasps lay their eggs in the female flowers, inducing galls to grow in place of the acorns. These are where the wasp grub develops. There are hundreds of species of these wasps, each with their own distinctive gall structure. One of these galls – a sphere made by the Andricus collari wasp – makes indelible ink when it's crushed and mixed with water, iron sulphate and gum arabic. Gall ink was used in historic documents for 1,400 years until the 19th century. 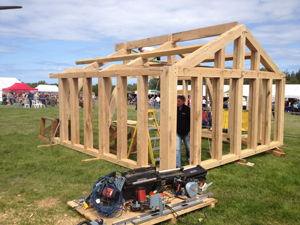 Oak was a vital building material too in earlier times. 13th-century masons used 2,641 tonnes of oak to build Salisbury Cathedral, felled in spring 1222. The timber came from Ireland as well as England, although English oak, with its wide bands of earlywood, was preferred to the tighter-ringed Irish wood for its lightness and strength. And in the 18th and 19th century there was a frenzy of oak planting in Britain to supply the timber for the navy's warships. It took 6,000 oaks to make HMS Victory – "a product of mediaeval acorns that dropped all over Britain". The curved boughs of oak trees were especially useful for creating the shaped hulls. By August of the second year, the 3-D image shows the oak has created 230 kg of new wood in 12 months, forged from the carbon dioxide (and water) absorbed during photosynthesis. It has also released 234,000 litres of oxygen into the atmosphere from the leaf stomata. how oaks react to gale-force winds. At a Forestry Commission research site outside Edinburgh scientists rig an oak tree with sensors then winch it over until it's uprooted. Their instruments show it begins to fall when it's only six degrees from vertical – but it would take a Force 10 storm to produce the same effect. how much water an oak pumps out of the ground in spring. Probes attached to a sap flow monitor measure this at 70 kg an hour at the peak, passing up to the leaves through the xylem vessels. The cambium produces new cells which differentiate to form xylem and phloem tissue. When oaks took root in Britain after the Ice Age. Four-metre cores of peat taken from Wytham Fen show oak pollen, preserved in the soil, first appearing 9,000 years ago. You can watch Oak Tree: Nature's Greatest Survivor on BBC iPlayer until 31st October 2015. Click here for the link. There's also a programme website. This year, our Oak Trees have not produced any acorns. Earlier in the year, we noticed other structures had fallen from the trees. They were about the size of an acorn but with more of a flower structure. I am wondering if these could be the male flowers mentioned in the article above. We are on the edge of The Pennines and have experienced some weird weather this year. In spring, we had a lovely start, hot enough for the hammock, followed the following week with severe frost and very strong winds. Some azaleas lost their flower buds and did not flower. Many other plants were adversely affected too. We are wondering if this extreme weather affected the Oak trees? It was not just our garden. We saw the same things had fallen from trees in the nearby lane as well and no acorns. Not good news for squirrels etc surely? I found this fascinating. I studied Zoology but have very limited knowledge of botany which I find frustrating: the two have to go together to make real sense of ecosystems. I would love to read more like this.